Hyperdynamic changes in cerebral blood flow and brain metabolism during CA + CPR. There is a huge unmet clinical need in our understanding of cerebral blood flow (CBF) and brain metabolism during acute brain injury that limits our ability to treat patients in emergency situations such as focal and global stroke (including CA-induced ischemia). To investigate the mechanisms of CBF deficits during global ischemia and during/after reperfusion injury, a model is needed to mimic a clinical scenario lacking collateral circulation. CA+CPR is an excellent model that is very clinically relevant. 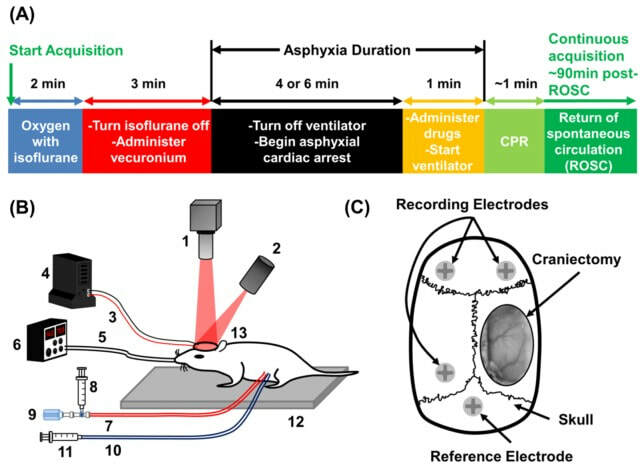 In collaboration with the Beckman Laser Institute (Professors Bruce Tromberg and Bernard Choi), we are applying advanced optical imaging techniques to the brain during our rodent model of CA+CPR. These techniques include laser speckle imaging (LSI) to monitor CBF changes and spatial frequency domain imaging (SFDI) to monitor changes in brain metabolism. LSI along with SFDI, a technique invented and pioneered by the Beckman Laser Institute, used in combination with EEG monitoring allows us to investigate changes in CBF and brain metabolism while the brain loses and regains EEG activity during CA+CPR. During these studies, we also investigate changes in neurovascular coupling. Our recently published paper (Crouzet et al, 2016) demonstrates the first evidence of accurately predicting post-CA EEG recovery by analyzing CBF dynamics. This study elucidates decoupling between CBF and peripheral blood pressure as measured by clinical standards in the limbs. These findings are very clinically relevant, highlighting the importance of treating brain ischemia without relying solely on the blood pressure measured in the limbs. 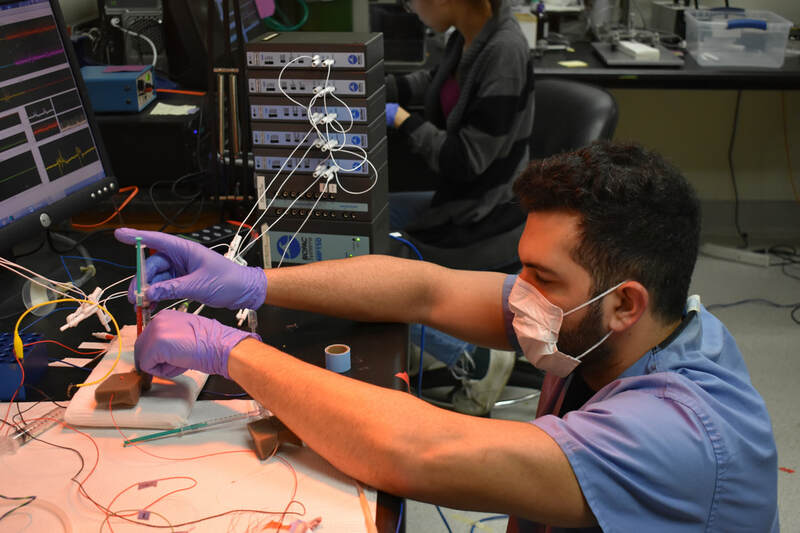 This work is funded by a 3-year NIH NIBIB R21 “Trailblazer Award” focused on using optical imaging to investigate the hyperdynamic periods of cerebral ischemia and reperfusion during CA+CPR.